An estimated 19 million children, under the age of 15 are visually impaired. Of these, 12 million children have refractive errors, a condition that can be easily corrected with a pair of glasses. World Health Organisation 2013. What is refractive error? Research Grants for Future Eye Care Leaders. Through the College of Ophthalmology of Eastern, Central and Southern Africa (COECSA), So Kids Can See will offer young ophthalmologist with research grants to improve child eye health. The College of Ophthalmology of Eastern, Central and Southern Africa (COECSA)has the vision for eye health for all in Eastern, Central and Southern Africa. With the mission to improve the quality of eye care through training, research and advocacy; provide leadership in eye care; and create a forum for exchange of ophthalmic skills, knowledge and resources in Eastern, Central and Southern Africa. COECSA additional, unites all eye care professionals across 9 members countries: Kenya, Uganda, Tanzania, Rwanda, Burundi, Malawi, Ethiopia, South Sudan (Republic), Zambia and members also join individually from other countries. So Kids Can See values the importance of building the capacity of local organisations by helping create value for members and sustainability through increased membership for COECSA. For young ophthalmologists who are members of COECSA, So Kids Can See will offer research grants with the goal of improving child eye health. 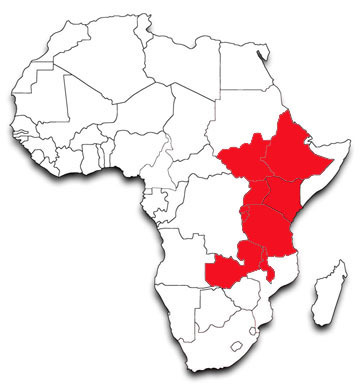 COECSA Region: Kenya, Uganda, Tanzania, Rwanda, Burundi, Malawi, Ethiopia, South Sudan (Republic) and Zambia. "More than 400,000 blind children in Africa and many more with visual impairments," with more than 80% being avoidable or preventable, research is crucial in order to provide evidence to drastically decrease these numbers. "Children under-five are most at risk of losing sight due to health problems, and early detection of eye problems is critical." Visual loss greatly affects a child’s physical and cognitive development, "making eye health an important aspect of children’s development and overall wellbeing." The major causes of childhood blindness and visual impairment depend greatly on the context and where data is available. From known data, "corneal scarring from measles, vitamin A deficiency, the use of harmful traditional eye remedies, and swelling of the child’s eyelids due to infection." Additionally, relative to the large population and birthrate in Africa, many other diseases appear in greater numbers such as retinoblastoma, an eye cancer of childhood that burdens children's cancer wards with approximately 2,000 children affected each year, many of whom lose their lives to this aggressive, yet curable cancer. Screening through antenatal care services and early childhood development programs where in existence are exemplary for case detection, however these services and programs are greatly lacking sub-Saharan Africa.According to a report on Child Eye Health in Africa: The Status and Way Forward by The African Child Policy Forum (ACPF) and ORBIS Africa, only 12 countries out of 54 have undertaken national Avoidable Blindness surveys in Africa or maintain some/or any data on blindness. Research funding is greatly lacking for local doctors in sub-Saharan Africa. So Kids Can See aim in offering research grants to young ophthalmologists is to increase the data available, such as national Avoidable Blindness surveys, and childhood eye databases. These research grants are the beginning of creating opportunities to further develop projects and programs for phase II that So Kids Can See would additional fund as a result from the research in this phase. Helping build up our future eye care leaders in Africa. Be an active member of COECSA. Graduated residency training within 2 years. Focus on child eye health, in one of the following areas: Early detection/screening, prevalence/frequency, transition to adulthood or primary prevention. Through the important findings that the young ophthalmologists encounter from Phase I research grants, So Kids Can See will offer additional funding to develop and support projects or programs that offer solutions to these findings. These grants will open after successful completion of Phase I.